Make Health – Not War! Presentation by Matthias Rath, M.D. We are here tonight, because the message I stand for, the scientific discoveries, I have been privileged to contribute, are not welcomed by those who make health care. Otherwise, you would hear about this breakthrough from Dan Rather, or in the morning news, or you would read about it in the New York Times. Even better, you would be living in a world where the diseases that brought you here tonight, especially cancer, are long gone. This is not the first time that something is wrong on planet Earth. The great philosopher Schopenhauer stated: “Really significant steps forward for mankind go through three stages. First, they’re ridiculed. Second, they are heavily fought by those who have economic interests in the status quo. And finally, when the dam is breaking everyone says: Well we knew it all along.” We are somewhere between stage two and stage three with the message that cancer will no longer be a death verdict in future generations. For millennia, people have looked to the sky. They’ve seen the sun rise in the east and settle in the west. They’ve looked to the stars in the night, and they knew it. The earth they concluded, is flat. They also were convinced that the sun circles the earth. How in the world could anyone doubt that? Then this man came along, Galileo Galilei. When he was born the sun circled the earth. When he died, the earth circled the sun. Of course, nothing has changed in the course of the universe, it’s just the way that mankind learned to look at the universe. Today, everything that Galileo stated four hundred years ago is confirmed. And yet, when he said it for the first time, it was so threatening that he was shown the torture instruments. He died in exile for saying the truth. There are other examples. For millennia, the number one cause of death for the people on this planet were epidemics. In the sixteenth and seventeenth century, one third of Europe was killed by the plague and other epidemics. And it was very well known where these plagues might come from. In the eyes of the people then, they were the punishment for the sins of the people. No one questioned that, until Louis Pasteur came around. With the help of the microscope, he found out that there is a biological basis, for the plague, called microorganisms, e.g. bacteria. It was this discovery that led to the development of vaccines and later of antibiotics. Was he embraced by the medical community at that time? Of course not. The Medical Academy of Paris – he was a Frenchman – said, “Who are you? You are not even a doctor; you are just a chemist.” It took more than twenty-five years for Pasteur to fight, to change this dogma. On July 6, 1885, he vaccinated a young boy, nine-year-old Joe Meister, who had contracted rabies and would have died for sure, if not for the discovery of Pasteur. This was the turning point – after 25 years. This delay was costly. On a global scale, hundreds of thousands of lives could have been saved between the first discovery of this man and when it was finally accepted. On his ninetieth birthday, the world honored him. Presidents, emperors, came to Paris to pay tribute to this man who had given mankind more than any politician. Today, another epidemic haunts mankind – cancer. If you go to the doctor and the doctor tells you, “I’m sorry. You have cancer.” What’s your first question? “How long do I have to live?” You don’t ask, “Doctor, what can I do or what can you do?” You ask, “How long?” What does that mean? You have accepted the fact; that it’s a death verdict. More than a half million Americans die from cancer every year. And yet, the scientific basis to stop cancer naturally has been around for almost ten years. On this manuscript page, I scribbled down in 1991 the possibility that one day cancer would no longer be. The use of lysine, an amino acid, in combination with ascorbic vitamin C will lead to a breakthrough in the control of many forms of cancer and other diseases. These discoveries were published. The pharmaceutical companies, their executives, and researchers read it. The people from Pfizer, from Merck Sharp & Dohme, Bayer, BASF; they knew it for all these years and yet they didn’t do anything. There is another aspect that I need to address: Who is paying for this lecture tour? The answer: The people we have helped in the past. Based on the discoveries I made, we have developed natural health programs. They are the leading natural health programs in Europe – heart disease, cancer, high blood pressure and so on and so forth. And the people who support us there, they want us here, to help spread this message around the world. So Mr. Pilniok came back because he believed that machine is defective. Cancer was not visible on the control scan either, so the doctor said, “You know, we have to wait a little bit, then you have to come back after 3 months, because it can’t be that the cancer is gone. It can not be.” So he came back for the second control scan. Same results. Then Mr. Pilniok said, “You know what Doctor, you finally got to get to come with the fact that it is gone.” So the patient was educating the doctor. When you came here tonight, cancer was a death verdict. When you will go, it will be just another preventable and treatable health condition. These are the people dying in America everyday, about 2,000 from heart disease, just below 1500 from cancer, about 500 from stroke. That’s the dimension, imagine! In the year 2000, cancer costs in health expenditures and in lost productivity surpassed 180 billion for a health problem. And the question arises when you open the newspaper, when you open Time Magazine or Newsweek, USA Today – four-color advertisements. They read: “We are there because one day cancer will be gone – Pfizer, Merck, Bristol-Meyers Squibb, Aventis.” Fifty-five thousand scientists are employed in the research laboratories of those companies. 32 Nobel Laureates have received Nobel Prizes on cancer research aspects. Millions of dollars have been spent, both private and public ones and yet the epidemic is expanding. How can you explain that? Why have they not succeeded? One of the reasons is this one: Cancer is a multi-billion dollar business. If you are a patient with cancer, the doctor tells you, “We got to give you chemotherapy.” You ask, “Doctor, tell me, why, what does chemotherapy do?” He or she says, “Well it kills the cancer cells.” What does he not tell you? It kills all the other cells too. It is like taking a shotgun to the human body. The same goes for radiotherapy. An x-ray beam doesn’t distinguish between a cancer cell and a healthy cell. How could it? But maybe, just maybe, this is not so unintended as we shall see. Chemotherapy, radiotherapy, kill cancer cells and healthy cells alike. Or why does your hair fall out? Because the hair follicle cells are destroyed. Why do you bleed from the gastroinintestinal tract from the bowels? Because the cell lining there is destroyed. Why do you get infections? Because the cells that produce blood cells in your bone marrow are destroyed. What are the side effects of chemotherapy? I’ve mentioned anemia, bleeding, but there is more: Heart damage, infections, liver and kidney damage, nausea, depression. Each of these diseases is associated with what? More money to be made. Pain killers, cortisone, for the inflammation. Blood substitution, antibiotics, anti-depressants, the pharmaceutical market for the so-called treatment of side effects for chemotherapy is bigger that chemotherapy itself. Selling drugs for the treatment of side effects of chemotherapy is big business for the drug companies. Chemotherapy, radiotherapy, the side effects. They cause new cancers, new diseases, so you need more drugs. These new drugs cause side effects, you need even more drugs. It’s like printing money. If there is one thing that I will do tonight, I will shake you up. What interest does the pharmaceutical industry have to stop cancer if they have revenues of one hundred billion dollars in the US alone every year from keeping cancer ongoing? What is the interest they have? Any idea? I have one. That’s the interest they have. The only reason why cancer is still a death verdict are the billions of dollars drug companies make from the ongoing cancer epidemic. If we want to win the war against cancer, we need to understand what cancer is. The next part of my talk will be helping you to explain it in very simple words. How cancer develops. It starts with a health cell that turns into a cancer cell that turns into a local tumor, and then ultimately it spreads through the body until the host of the cancer is dead. The purpose of the cancer is to kill the host. Let’s look at a healthy cell, the three elements that are important for you to know. This one is the cell core that stores all the software information for what this cell should do. For example, this is a thyroid cell, it’s producing thyroid hormones. The white blood cell, it produces antibodies. How does the cell know what it should do? Well, all this information is stored in this software program or the cell core. The production of these things – hormones, antibodies, etc. – are in the little production centers that each cell has, and then the cell also needs energy. That’s provided by the cell power plant or mitochondria. No matter what cell it is in your body, they all need bio-energy. They all need the energy to accomplish the job and the fuel for this job are vitamins, minerals, amino acids, and trace elements. What turns a healthy cell into a cancer cell. There are many reasons why that can happen – radiation, pollution, in most cases, pharmaceutical drugs. But irrespective of the causes, a cancer cell always has two things in common, irrespective where it starts in the human body. Whether it’s prostate cancer, lung cancer, whatever, the first thing is something you know. It multiplies; it creates identical copies of itself. The second characteristic is something that you may not know, but you can easily imagine why that is necessary. If a cancer cell starts, it is contained by connective tissue – collagen, confines it where it is. Cancer cells that are real cancer cells, they produce the biological scissors to break out, and these are enzymes that are able to digest the surrounding collagen. You can see those little Pac Men here leaving the cell, these are enzymes. What do they do? Here is how cancer starts. Thousands of enzymes produced by cancer cells destroy the surrounding connective tissue. Here are collagen fibers; those biological scissors attached to those collagen molecules and they break them up so the cancer cell can migrate through them like an expedition corps in the jungle, which have machetes. A local cancer wants to ultimately spread through the body. How does it do it? We know it metastasizes. How does that happen? The cancer cells use the bloodstream, a very convenient way to get to other locations. But how does a cancer cell get from the normal tissue into a little capillary into a blood vessel from the outside into the inside? The only thing we need to answer now is what the wall of the blood vessel made of? Collagen. The same molecules, these enzymes, these biological scissors attach to and so here we see a cancer cell from the liver migrate into a blood vessel which is magnified here. The blood vessel is within the liver here, and the cell migrates from the outside with the help of these collagen-digesting enzymes to the inside of this blood vessel system and is flushed away until it reaches the little capillaries in the lung where it gets stuck because the capillaries of the lung with the exchange of the oxygen, they are very small and so they finally get stuck there. And what happens then? They work from the inside to the outside and suddenly they are in another organ. Now we understand why lung metastases are so frequent. Why is cancer so aggressive? Why has our body not developed defenses against this disease? Cancer cells trick our body by using tools that our body already uses under healthy conditions, so it’s confused. It doesn’t dare to develop defense mechanisms because it thinks it may be normal. White blood cells, the police cells of our body, have a job to attack microorganisms. Now let’s assume we have a pneumonia infection, bacteria in our lung tissue. The white blood cells that circulate, as the name says, in the bloodstream, they need to get from the inside of the blood vessel to the outside and finally to the bacteria in the lung tissue. How do they get from the inside to the outside? Collagen-digesting enzymes, the biological scissors. White blood cells have the ability to produce them just for a few seconds as long as they are needed to get to do their job and then they stop. White blood cells are also called leukocytes, and they have the ability to produce collagen-digesting enzymes; and suddenly, while this is a picture showing the white blood cells migrating through a blood vessel leakage that they just created themselves. White blood cells leave the bloodstream by using collagen-digesting enzymes. Now we also understand why leukemia is such a frequent form of cancer. If you ask your doctor, “Why is leukemia a frequent form of cancer?” he says, “Well, I don’t know, come back in a week, I’ll read about it. Don’t ask me these questions.” It’s mystifying, but it’s not. The answer for that is white blood cells, the police cells of the body, have the ability already under normal conditions to produce those biological scissors and if they become malignant, if the software of these cells turns awry, goes crazy, they do that forever, uncontrolled. They don’t stop to produce those biological scissors and that’s what we call leukemia. Another example, in order for an egg, during female reproduction, or during the female cycle, to leave the ovary and to migrate to the uterus, it needs to leave the ovary, right? So it needs to get from one organ, the ovary, to the fallopian tube and finally to the uterus. But how does it do it? By now you should know the answer, collagen-digesting enzymes; but only for a few seconds, just enough to release one egg out of the ovaries –not five, not ten, one egg. Under the influence of estrogen, in the middle of the female cycle for a few seconds, for a few moments, enough collagen enzymes are produced to allow one egg cell to leave the ovary and migrate to the uterus. And suddenly, we understand something else. Why are cancers of the reproductive system, of the woman so frequent? Because the cells involved in that are already producing those collagen-digesting enzymes under normal conditions. Have you ever heard of ovarian cancer? Do you understand the connection? You know, medicine is very simple; we just need to think at the level of cells. Ovarian cells use collagen that’s produced already under normal conditions during the monthly female cycle and if these cells turn malignant, they produce collagen-digesting enzymes in large amounts forever. And this is why cancers of the female reproductive systems are so frequent. And we have to understand the natural balance of collagen digestion under normal conditions. These destroying enzymes here are in balance with the neutralizing, with the blockers of this process. In the case of natural processes, of the leukocytes that attack microorganisms, bacteria, or in the ovaries, for a very short moment, there is an imbalance. There are more destroying enzymes because these cells need to get to some other organ and quickly after that, the neutralizing aspect is there. The balance is kept between collagen digesting enzymes and their natural blockers. In cancer, this balance is gone because the destroying enzymes are produced uncontrolled forever and the natural blockers are too little. And that’s where the amino acid lysine comes in. It is able to correct this natural imbalance and restore to a natural balance. That’s what I wrote down in 1992: “The use of lysine and synthetic lysine analogs particularly in combination with vitamin C will lead to a breakthrough in many forms of cancer.” This is a model of the natural molecule lysine. “What’s significant about lysine is it is an amino acid. Amino acids are building blocks of the proteins in our body. There are about 25 amino acids that we know. About a handful of them we cannot produce in our body. They are so-called essential amino acids. The single more important among them is the amino acid lysine. We cannot produce that molecule. And yet it has such a great importance. It plucks them out of those Pac Men, so the lysine molecules blocks those Pac Men from attaching to the collagen fibers and destroying them, that’s what lysine does. And the combination of vitamin C is particularly important because vitamin C does what? It forms collagen. We know that from the sailors’ disease scurvy when they tried to circumnavigate the globe some 500 years ago, they died from bleeding because they had no vitamin C production in the body and no vitamin C on board, so the collagen production ceased. And the first organ where this became obvious was the blood vessel system because of the blood pressure. And now we understand why these people died. But the bottom line here is we have the combination of lysine, a blocker of collagen destruction, and Vitamin C, an enhancer of collagen production, together leads to something that any medical doctor that treats cancer patients, and for that matter, many other diseases should cherish. Stability of the connective tissues. Encapsulation of the tumor. We presented our data at a few scientific conferences. We will also be sharing the new results on the nutritional conference that will take place next month in Texas, and in November at an international cancer meeting in Frankfurt, Germany. So what were the tasks that our researchers were facing? The first one was how we can stop the spread of cancer cells using natural substances, such as Lysine. And the second one, how we can kill cancer cells and how we can eliminate cancer cells selectively without destroying healthy cells, also by using natural substances. All our bodies are very complex; therefore, if we want to study the specific processes that are in the body, we use biological models. All scientist work with models that simplify the process that we want to study; therefore, as the step one in our research, we used such a biological model. You can see this on the picture. This was the model that we used to study the spread of cancer cells, the invasion of cancer cells through extracellular matrix. These are biological vials; what is characteristics that you can see here? That these vials have a partition in the middle, that looks like a grid, and this partition is made of connective tissue — the same tissue that surrounds cancer cells in our bodies, made of collagen, other proteins and substances. We placed an identical number of cancer cells in the upper portions of these vials. 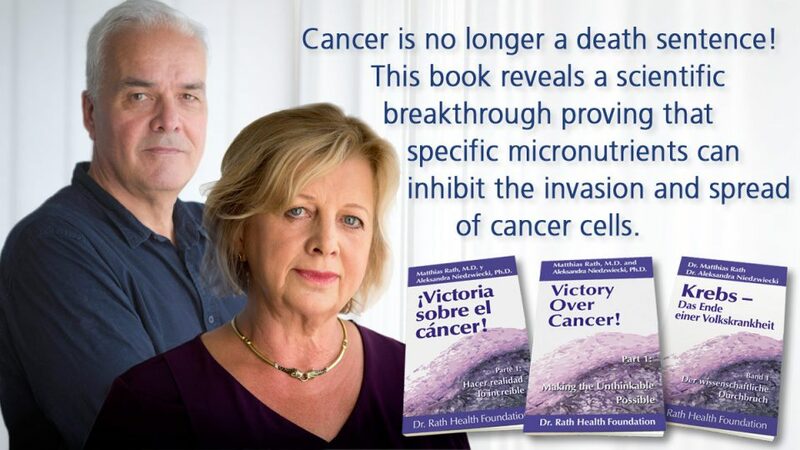 Cancer cells were suspended in the medium that resembles original natural surrounding of the cells in our body; so these mediums contained growth factors, amino acids, sugars, nutrients, everything that cells need to grow and they have available in our bodies. What was the difference between these two vials? It was only one difference, in the vial on the left hand side, the cells were suspended in the medium, which did not contain an amino acid lysine, while the cancer cells suspended in the top portion of the vial on the right contained lysine; so by this design, we were able to check the effect of only one nutrient, which is lysine, on the spread of cancer cells. Also, on the ability of the cancer cells to secrete enzymes that helps them to break through this connective tissue barrier and move to the other portion of the vial. We left these cells for twenty-four hours and then the next day we counted how many cells were able to secrete collagen-digesting enzymes and break through the connective tissue barrier, connective tissue membrane. In here you see the results. In our experiments, we tested three types of cancer cells: breast cancer, colon cancer, and skin cancer. So what you can immediately see is that lysine happens to be very effective in stopping the spread of melanoma cells. As you see on this picture, about nine out of ten cancer cells were stopped. They could not penetrate the connective tissue membrane. However, the lysine was not as much effective for other types of cancer cells; for breast cancer and colon cancer. We knew that we can increase this inhibitory effect by adding more lysine, so we tested this. If we added more lysine, the inhibition of cancer spread was more pronounced, but we did not want to use high quantities of one nutrient, so therefore, we tested whether we can develop nutrient synergy by which we can achieve the same effect like with one nutrient. So we took breast cancer cells, the cells that were most resistant to lysine, and we added two other nutrients such as vitamin C and proline.The inhibition of cancer spread increased, so it looks that only four out of ten cells were able to digest connective tissue. However, we added another substance, EGCG, which stands for this complicated name Epigallocatechin Gallate. This is a polyphenol fraction from green tea.What happened? All breast cancer cells stayed in one portion of the vial and they lost the ability to secrete enzymes that digest and destroy connective tissue. The spread of breast cancer cells was stopped. Therefore, we tested whether the other cancers respond the same way. In addition to breast cancer cells, also the invasion of melanoma, fibrosarcoma, liver cancer, prostate cancer, colon cancer were inhibited, not by drugs, but the combination of nutrients, amino acids, vitamin C, polyphenols from green tea, and other natural substances. I would like to turn your attention to another aspect, important especially for people who have been using alternative approaches; that alternative approaches often use mega doses of nutrients. And therefore, consider a green tea, it has been know that green tea has an anti-cancerogenic effect. In fact two days ago, the US department of Agriculture issued the statement that green tea is beneficial in preventing cancer and other diseases. So we tested the effect of just EGCG (green tea fraction) on the inhibition of the spread of cancer cells, and we were successful. We were able to obtain complete inhibition of cancer cells spread, but look how much you would have to use to achieve that — one hundred forty cups of green tea. It’s amazing, per day, yes, its toxic. But what we know is that nutrients work in teams, we develop synergy and then we are more effective. And therefore, we tried to develop such a nutrient synergy. We looked for the best combination to achieve 100% cancer spread inhibition but not using mega doses of nutrients. When we combined other nutrients, such as amino acids, trace elements then the amount of EGCG that was working in this team was rather small, equivalent to about 6 cups of green tea. But it is important that you have to use this green tea extract together with other nutrients. So nutrient synergy means using nutrients in smaller doses which is more effective in achieving complete effect, which is a complete inhibition of cancer cells spread in the body. We were able to put cancer cells in prisons behind the walls. What was the second aim? It was to find whether there are nutrients or nutrient combinations that are effective in selective elimination, killing cancer cells, but preserving healthy cells. Just something’s different than this pattern of chemotherapy and radiation. Therefore we tested various nutrients combinations and we tested individual nutrients, such as ascorbic palmitate, which is a fat-soluble form of vitamin C. We were able to obtain significant inhibitory effect on the growth of melanoma and breast cancer cells and liver cancer. We achieved this with nutrients, natural substances. At the same time normal cells were not affected. They stayed healthy. Somebody asked whether this is just in vitro study? The first part I presented, they were with invitro studies. But these studies were done with nutrients, substances that are available now, we don’t need to wait until they are developed and new formulations are done, they are safe substances. And therefore, many people took advantage of these research findings and their potential health benefits. 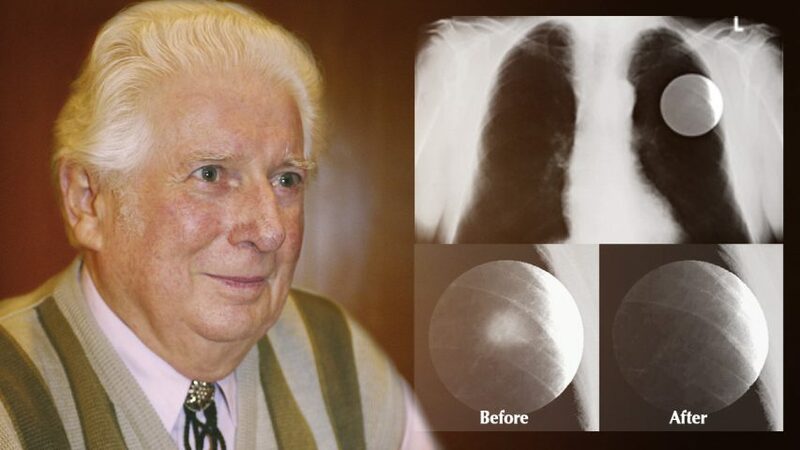 For example Mr. Pilniok, who Dr. Rath presented to you, he had lung cancer and after seven months his cancer was completely healed, eliminated. We have more testimonials from people who took advantage of this finding, Mr. Preats who was diagnosed with testicular cancer, underwent surgery, then his physician advised him to use chemo therapy, but Mr Preetz said “ no, I will try something else” and you can see he made a good decision. You can see that one of the two cancer markers decreased from 169 to almost 9, after three months of following this program. Another cancer marker was completely reduced, also, his lymph nodes started to decrease, the size of lymph nodes started to decrease after 3 months only, showing that the immune system was not overloaded. More encouraging results: Prostate cancer is a very frequent cancer in men. You can see the PSA value, a prostate cancer marker that in this patient decreased from May to August, already in 3 months from the value almost 60 to 1. A very significant result with a natural program. More advanced types of cancer. We had people who used natural approaches in cancer that already metastasized. Here you even have an example of breast cancer that spread already to the bone and you can follow the change in cancer markers. A marker indicating breast cancer : about 50% decrease in one month, some people say unbelievable, but this is the result. Bone degradation marker also decreased after three months. So this approach is effective also in more advanced cancers. We have several clinical studies currently running in various types of cancers, our protocols were approved by IRB Commissions that are controlled by the FDA and the National Institute of Health and any study that is being conducted in the hospital or in the clinic has to be approved by IRB Commissions composed of physicians, scientists, psychologists and others to make sure that study protocols fulfill all the scientific, medical, and ethical criteria. We have our cancer study protocols approved. If you have a doctor that is interested in doing studies with us, please contact us, we can provide protocols and cooperate with them. And here is just to confirm that we have reports of positive results with cellular health approaches in various types of cancers. Esophagus cancer, with complete healing of the cancer, in ovarian, colon and in many other cancers, why? This is not a miracle. This approach works because we tackle the same mechanism, which all types of cancers cells use to spread. You may ask, are these nutrients safe? And here we tested the effects of this nutrients combination in a dose that is five times higher than a recommended dose. We tested the effects of these nutrients for the signs of liver damage, heart and kidney damage. As you can see, there is no damage, there is even improvement in these markers, which also is not surprising because these nutrients also work in enhancing, optimizing the function of cells and tissues in the body. I would like to summarize quickly why this cellular health approach works. First of all, we target, the critical process for cancer, which is metastasis. 90% of deaths are due to spread of cancer, not to primary tumors. Then we tackle the mechanism, which is universal for all types of cancer. Cancer spreads through the body using this matrix-digesting mechanism. Then we use multiple approaches; we don’t target one single process. Nutrients work simultaneously on various biochemical processes in the body. And therefore, if we attack cancer cells from different angles through different processes they use to expand in the body, this is where we can be most successful, and we are. Also, we are using nutrients, which have “side effects” in the term that they support many positive body functions. They optimize functions in the body to enhance health, they enhance function of your immune system and of course, nutrients don’t have side effects. I would like to present our research team. We have physicians, Ph.Ds, nutritionists, working with us and we will be providing more research data in the future. You have to understand that the things we are presenting do not come by themselves. The twelve years spent battling those interest groups is one of suppression. It takes its toll, so I’m grateful to have a confidante and co-combatant in this battle, Dr. Niedzwiecki. She started her scientific career in the U.S. not far from here at the Rockefeller University, working with a Nobel Laureate, Professor Edelman, and then on the other side of the U.S. in California, with Linus Pauling, another Nobel Laureate. So what you hear is not just some faith, it is reality and some people ask me, “Dr. Rath, how does it come that you are still able to speak openly? How does it come that you are not somewhere else, because they contained you, like many other alternative health people too?” It’s difficult to combat the truth. What do you think where I would be if I told you sweet little lies? Certainly not here. The other side would have shut us up long ago. The next part will briefly bring you through some other diseases that we have solved over the past years, actually that we focused on, cardiovascular disease, and because I know that you know people with these health conditions that we will go through. Cellular Medicine, the understanding that diseases develop at the level of cells, is the scientific basis to eradicate today’s most common diseases. Let’s say it’s a health problem. Say it’s a heart problem, angina. You go to a doctor called a cardiologist. There’s the gastroenterologist, the orthopedist, the neurologist, pulmonologist, and so forth. For every office, every organ there’s a specialty doctor. While that is interesting, it does not reflect the scientific basis of health and disease, because that is determined at the level of small units of our bodies, the cells. If they’re healthy – no disease: if they fail, disease develops and this is how it happens. Here is one cell. First of all it starts to malfunction, then it becomes sick and only then, if many of these cells become sick we will develop a disease in an organ. So heart disease doesn’t start in the heart, it starts in the muscle cells of the heart. Brain disease, liver disease, don’t start in the organ, it starts at the cellular level. Long-term vitamin deficiency, more precisely vitamins, minerals and micronutrients that are needed to keep the cells healthy here, is the most frequent underlying cause of chronic diseases. The mitochondria are like burners. They burn things and this is the biological fuel that they need: vitamins, amino acids, trace elements and minerals. Every cell in our body requires the same fuel and the diseases start at the level of cells, the most frequent diseases are the ones where the most fuel is burned. The heart has the most workload to do in our body. You need to understand things at the cellular level, so in summary, cardiovascular disease starts at the level of the cells that make up the wall of the artery. If these cells are fed with the right fuel, these cracks and crevices do not develop. If you don’t feed them, the same things happen as with the sailors. The artery walls become impaired, weakened and cracks and crevices develop, so heart disease is nothing but an early form of scurvy, the sailor’s disease. What sets the heart apart from all other organs? It moves. If the arteries of the heart ride on top of the heart, with every heartbeat they are squeezed flat. It’s like me stepping on a garden hose a hundred thousand times a day and say, “Let’s see what happens.” If the garden hose is old, it’s brittle; that’s where the deposits develop. If it’s new, elastic, intact, if I have enough vitamins in my blood vessel walls, they’re elastic and nothing happens. Suddenly, we understand why we get heart disease and not nose disease. On July 2, 1992, Linus Pauling, two time Nobel Laureate and I stood in the Mark Hopkins Hotel in San Francisco telling the world and I am reading this in the hand writing of Linus Pauling – “The goal of eliminating heart disease as the major cause of death and disability is now in sight.” In a press conference, we were shouting it out to the world that Heart disease can be eradicated. Who blocked it? It is those who have identified cardiovascular disease as the number one source of income and cancer as the number two source of income. So we went on. Despite that blockade, we proved it. Ultrafast Computed Tomography, patients with existing heart conditions. This is an x-ray of such a patient. You look from the bottom into the heart. This is the coronary artery. The white spot is the deposit in the coronary artery. Patients before and after one year on Cellular Health formulas; there is no bypass surgery involved. There is no angioplasty involved. It’s feeding the cells of these artery walls with the right nutrients so they can activate the self-healing therapy that produces enough stability molecules to heal the blood vessel wall. What’s the deposit of cholesterol in the blood vessel wall? A plaster cast for a weakened artery wall. The wall gets weak, so it needs to be repaired. Cholesterol gets in as a repair. This is too long a deficiency, too long weakness. This repair over shoots and that’s what we call plaque. Another semester of medical school, here we go. So natural healing of arteries instead of bypass surgery. You know what, your children and grandchildren will look back to you in the twentieth century and say grandma, grandpa, what did you tolerate? They were operating a bypass on your heart and they were telling you what they were doing – a bypass. What does it mean? They were bypassing the problem. As of today we know that the future of medicine is cellular health, the understanding how feeding the cells that make up the blood vessel walls will stimulate the self-healing processes in the cells enabling natural stability and making the deposits there redundant. Next disease: High blood pressure. About two hundred million people worldwide suffer from high blood pressure. The epidemic is expanding, which means, we don’t know where it comes from. Yet the answer to that is very simple. If the walls of arteries are vitamin deficient, not only do they develop cracks and crevices, also the diameter of these blood vessels narrows because the little muscle cells that make up the artery wall get a spasm. Now what happens to a pipeline that gets narrow with pressure inside? It rises; a plumber knows that, another semester of medicine. And of course we have done the clinical studies for that. This was a study with patients with high blood pressure. It seems to be little — this of course has to be a 200, 180, 160, 140 — this is the one I am missing here. The bottom line is the systolic blood pressure went down by 20% and the diastolic blood pressure went down by 20% in 16 weeks, that is four months. No side effects. So it’s very real when we say ‘health for all by year 2020’ – understanding what the cells in your body need. Another disease that just has found its cellular solution is heart failure – one of the most dramatic diseases. If you are diagnosed with heart failure today, your chances for being around in five years are 50%. What happened to the other 50%? Well they are gone. There are the patients with edema, shortness of breath. The heart pumps, the muscle cells need bio-energy. Do they get it? They pump normally, and if they don’t get it, weak pumping heart symptoms. What does conventional medicine do with heart failure? They bring those people to a heart transplant operation, because they do not accept the fact that it can be so simple. We’ll see that in a minute. We have proven that this deficiency of vitamins, minerals, amino acids, the cell factors, the cell bio-energy molecules that you have heard about are the true cause of this disease by testing it in patients with heart failure. In 80% of the cases, these patients who could not work any more, could go back to work and lead a half way normal life. 80% of the cases for a disease that otherwise is ‘treated’ by heart transplant, most of the heart transplants done in New York City in U.S. and Europe are with patients of heart failure. Yet, we know the cause of heart failure is not that the heart is damaged or foul or we don’t know where it comes from. But because the muscle cells that make up the wall of the heart here lack the fuel to do their job. I’ve summarized this semester of medicine in this little comic. It is like driving your car up to the gasoline station with your last drop of gasoline. And the other guy is please fill up my tank here is empty. The guy at the gas station who runs it, he has a white coat and a little stethoscope hanging out here. He tells you, you are filling up the gas tank, and you could better exchange the motor. How absurd conventional medicine is. And you know what, the truth is so simple that I can pull you through four semesters or five semesters in medicine in two hours. Now we need to address the most important aspect: The Pharmaceutical “Business with Disease”. These are the interest groups that block you from leading a healthy life and for that matter million of other people. Not because they are bad, but because the principle is wrong. Number one, the pharmaceutical industry is an investment in the street based on patents not on health. Secondly, the pharmaceutical industry is the most profitable of all industries that’s topping margins seen nowhere else of up to 1000% percent. Valium, the tranquilizer, has a mark-up of 1100%. The marketplace of the pharmaceutical industry is your body, but only as long as it was sick. So, prevention of diseases, root cause treatment of diseases is bad for business. And worse of all, it’s the eradication of diseases based on new scientific knowledge. You have to understand that the medicine industry among us thrives on the “business with disease”. Whole industries, whole sectors of our society are financed by this industry, by your disease. Media, medicine, politics, we’ll be seeing that there’s hardly any government these days that hasn’t been brought into office, at least with the support of this industry. I’ve mentioned the fact that this industry is based on patents. The precondition for a patent is that the molecule invented is new. So, the pharmaceutical industry is based on finding new molecules that the body doesn’t know. If the body doesn’t know a molecule, it needs to detoxify it. And suddenly, you understand why most of pharmaceuticals are actually toxic for our body and suddenly we understand, the amazing fact. That the fourth leading cause of death in America is the side affects, the deadly side effects of pharmaceuticals — only surpassed by people dying from heart attack, stroke and cancer. So the very industry that is here to tell you, “We are providing your health,” is causing an epidemic. That’s the form leading cause of death. And this is not dr. Rath saying it. This is American Medical Association Journal, April 15, 1998. One hundred and six thousand Americans die each year from the deadly side effects of prescription drugs — a statement by the American Medical Association. Many prescription drugs cause cancer for the reasons I just explained. Take estrogen; remember that ovary cell that wants to leave the ovary? What’s the trigger for that? Estrogen? But only one momentary peak – and this peak is sufficient to trigger the production of collagen-digesting enzymes that destroy collagen. And here are the doctors giving millions of women estrogen, forever. What do they do to the cells? They stimulate production of collagen-digesting enzymes, forever. And suddenly we understand why one out of three women taking estrogen, develops breast cancer. You understand that. And now we understand why everybody is amazed that the studies they are doing on hormone replacement therapy show that the overall health risk of hormone replacement exceeds the benefit. But 73 million prescription every year. And industry that causes epidemics take cholesterol-lowering drugs. In January 1996, the American medical association came out with a warning, all lipid-lowering drugs, cholesterol-lowering drugs, on the market are carcinogenic. What does it mean that word, carcinogenic? They cause cancer. And yet they are still like chewing them. It’s like printing money. You need to lower the recommendations of cholesterol in the bloodstream from which the doctors need to prescribe your drug. So what do you do? You buy the doctors who make the opinion. So, should we be surprised that on May 16, 2001, 23 million Americans were suddenly from one day to the next becoming cholesterol sick. Because the expert panel, paid by the pharmaceutical industry producing cholesterol-lowering drugs, has just lowered the levels of what is healthy and what is sick with a strike of a pen. You remember that there is no connection between cholesterol and heart disease. The Cholesterol-lowering drug business is a biggest marketing fraud of all times. This fraud scheme is probably only surpassed by the “indulgence sales” in the medieval times. If you put quarters up for the money made by the pharma-manufacture of cholesterol-lowering drugs every year. You surround the equator three times. The business must blossom until August 2001, that’s when card house, the Babylonian Tower of the Pharma Cartel started to collapse. 56 people had died from taking Bayer, cholesterol-lowering drug. I was in Europe at that time. Europe was on fire, literally. There was no doctor’s office where the patient doesn’t come in and say, you doctor, should have told me that. And the doctors said, “Well, I don’t know. Bayer didn’t tell us that”. 52 deaths from Lipobay/Baycol. 6 million patients, who had been taking this stuff, were in fear. There was a time bomb ticking in their body. Class action lawsuits by patients against Bayer, criminal complaints against the entire executive board of Bayer, Bayer shareholders loose billions of dollars because the share price dropped like a stone. And more significantly, and you need to understand that, there was a domino effect. Suddenly within a few days, patients taking calcium antagonists, ACE inhibitors, beta blockers and what not were studying to look at the side effects of the singular filling law-suites against other pharmaceutical companies. By the beginning of September 2001, there was no large drug manufacturer that didn’t have a law-suit on side effects of drugs. In early September 2001, the tower of Babel of the pharmaceutical business was moments from collapsing. The pharma investors knew that the long term losses would be hundreds of trillions of dollars – not billions – trillions. Because it’s suddenly known, that the pharmaceutical business is largely a fraud business, creating illusions. 80% of the pharmaceutical drugs sold in America have no proven efficacy, 80%. That just takes away the illusion that you have heart disease by taking away the pain for angina. They cannot take away the root cause. Because it’s bad for business. So the only way they can do that is by giving you the illusion, by treating the symptom while keeping the disease alive. So it is a cardhouse and that cart house is about to collapse. The pharmaceutical business is largely based on deception and allowing this fraud to become public in September 2001, would inevitably have caused the vanishing of the entire industry. Who would take deceptive products any longer? At the beginning of September 2001, the executives of pharmaceutical companies and their political puppets were shaking in their boots. They knew that a global creditability crisis of the pharmaceutical industry would inevitably result, threatening to become a political crises. Which government in the Us and Europe did not get into power without the help of the pharmaceutical and petrochemical interest? Certainly not my government in Germany, certainly nor yours in the US. For more than half a century, Germany had been the largest export nation of pharmaceutical products in the world. Since about a hundred years, all governments are brought, at least in parts, into position with the support of these industries. Today the US is the largest drug export nation closely followed by Great Britain. But then came September 11. Today, I am speaking in New York. I was thinking carefully about everything I am going to say now. But it has to be said: The pharmaceutical cartel abused September 11 to regain control over the global “business with disease”. They took advantage of an inkstand media black out. And they moved forward behind the cover of this tragedy to regain control. On September 26, 2001, two weeks after September 11 at the first meeting of European cabinet, called European commission. It passes a European wide law intended to ban natural health therapies for 280 million Europeans. The media were focusing on the tragedy in New York. No one could take notice of that. Their political lobbyists acted swiftly. Take Fritz Bolkestein, responsible cabinet member of the European Union Commission (cabinet) for economics. His second job: Board member of the pharmaceutical giant, Merck, Sharp and Dohme. We have to understand that the pharmaceutical industry is such a powerful industry that they just placed their lobbyists in the highest political offices. Nothing happens for coincidence. Since September 11, there are three different legislations European-wide that have been brought on the way with the aim to ban natural health therapies. In the US, the FDA and FTC seek to reverse the 1994 natural health freedom act also called the Dietary Supplement Health and Education Act. That allows the things that you heard tonight, natural health therapies, to be said and spread and disseminated freely. Where are the laws, I am asking, protecting us against the epidemic from drug side-effects? What a hypocrisy. There is an epidemic caused by pharmaceutical drugs, but no one seems to care. No one tries to protect us from those side effects. But the things that are real answers that you heard tonight are banned, in the shadow of one of the greatest tragedies that hit this planet here in New York City. Everything changed of course in wake of September 11. No one asked about the deadly Bayer’s drug anymore. Did you hear about them any more? The cross sectional law-suites against drug crimes for selling deadly drugs were out of the media focus. No one confronted politicians supporting this business with disease. The civil rights were curtailed and can be abused for any purpose. Any purpose, including the one that I am going to show you now. Criminalizing natural health, you are going to say what is that. On the pressure of pharmaceutical industry, European legislation is seeking to criminalize, make it a criminal offense to disseminate preventative and therapeutic benefits of natural therapies that are not patentable. You say, “Well, that’s Europe.” Well there is a global ban on natural health therapies currently prepared by using the united nations Codex Alimentarius Commission. This unethical legislation threatens natural health freedom in all member countries of the United Nations, including the United States of America. They meet November 4 –8 in Berlin. Another staggering puzzle: Boston Globe, yesterday, president O.K.s for 9/11 search followed families lobbying. For more than a year the families of the victims of the World Trade Center attacks had to lobby to start an investigation. Doesn’t that ring a bell? Wouldn’t it be known for any government to say, “Of course, we would be the first to investigate this.” And today’s New York Times, it really can’t get any more scary. The U.S. gave secrets to terror suspects. 48 classified FBI reports in the hands of Zacarias Moussaoui. The files were retrieved during searches in his jail cell in summer. What else is to come until we all wake up? I’ve shown you the representatives of the pharmaceutical cartel in Europe. Here is another one: Donald Rumsfeld, US Secretary of Defense was previously the CEO of Pharmaceutical multinational Searle. The Pharma-Cartel put their own man in charge to determine who long the bombs fall on Irak and other countries. I am asking the question, “Will the Iraq crises focus media attention until natural health has banned world wide, and the drug companies have regained control?” You know we are in a race. Either the things you heard today make it for all mankind. Or the Pharma-Cartel are able to put a lid on that for anther 50 or 100 years. I am from Germany and I hope I am representing a new Germany than I am going to show you now. There is a lesson from history to be learned. On Feb. 28, 1933, the German parliament the Reichstag burnt. The next day, the very next day, the civil rights in Germany were abolished. There was an act to protect the people in homeland implemented, the next day. Everything was drawn. All democratic elections were suspended until 1945. Of course, and I am saying very freely here, I am not comparing president Bush or any of the government with Hitler like some European politician did foolishly. Now who was IG Farben? Until 1945, IG Farben was the second largest petrochemical and pharmaceutical complex in the world. The Nuremberg Tribunal has split them up into Bayer, BASF and Hoechst (now Aventis). Take the tragedy of Auschwitz. Auschwitz started as a forced labor camp for IG Auschwitz. IG Auschwitz was a 100% daughter of IG Farben, that is Bayer, BASF, and Hoechst. Now this is picture also displayed at the Holocaust museum in Washington DC. The red circle here is the IG Farben industrial complex in Auschwitz. The yellow circle is the extermination camp. The size of the industrial plant is ten times the size of the concentration camp. This is an interest group so powerful that they even hide these basic historical facts for half a century from you. Or did you know about IG Auschwitz? I thought about everyone of these pictures and I still decided to show them. You need to understand one thing: These economic powers are determined to sacrifice the lives of millions of people – for profits. I show this connection because I do not want you to say to me one day: “You knew it – why didn’t you tell us?” Nobody should say I didn’t know. Our research proves that vitamin C, lysine, proline and specific extracts from green tea can inhibit the spread of cancer cells. USA Today didn’t want to publish it. Their legal department said, ”You? There are 55 thousand researchers working on that riddle.” The fact that they had to publish it showed that we had proved everything that is written there. We did it, because it has to be said to the world, once and for all. USA Today is the largest newspaper in the world. It’s read not only in the United States, but also all over the world. The politicians read it, the pharmaceutical companies read it, the doctors read it, and above all, the patients read it and so many of you saw it, too. It followed that the San Francisco Chronicle on May 12, called it the holy grail of medicine and said we now know that all forms of cancer spread in the same way, just six or seven days after this announcement. Before that, it was all different. Every form of cancer was a new market place. There was news about breast cancer therapies, prostate cancer therapies, and what not. This was published in a weekend edition – two pages with illustrations resembling the illustrations from my book. Most amazingly, three months later, on June 19, 2002, the American Medical Association came out reversing a 20-year-old anti-vitamin policy. The American Medical Association is now advising all Americans to take at least one multivitamin pill each day. The reason for this: Scientists’ understanding of the benefits of vitamins has rapidly advanced, and it now appears that people who get enough vitamins may be able to prevent such common chronic illnesses as: Cancer, heart disease and osteoporosis. After twenty years of blocking vitamins, only weeks after we really pushed it in their faces? While you may have read about some of these things you probably didn’t know who triggered them. Now you know it. This list of events we triggered with our research gives me the confidence to say there’s no way that this can be stopped. It has gone too far – it has spread too far. And you know who paid for that full–page announcement in USA Today? The same people who paid for this room tonight. The same people. And that’s another take-home message for you to think if you really want the disease that many of you carry, and many of you know friends who carry it, if you want that disease to disappear, only you can accomplish that. Cellular Health is the scientific basis to eradicate today’s most common diseases and achieve Health for All by the Year 2020™. I am not an illusionist. I know there will still be diseases around in 2020, but I also know that heart disease, cancer, strokes, diabetes will be a fraction of what they are today. But I also know that the knowledge about how to tackle the rest of these diseases will have spread worldwide, and by the same token, the Number Four cause of death, the deadly side effects of pharmaceutical drugs will have disappeared because they are no longer needed. I am challenging you: Who, if not you? When, if not now. But it’s not enough to fight for a healthy world. It’s also important to fight for peace. I have worked with one of the finest human beings. Linus Pauling received a Nobel Prize not only for chemistry, but also for peace, with his fight against nuclear testing. President Bush, declare war against cancer and other diseases, not against the people in other countries.